Harbour Loft, a cosy, light and airy top floor apartment is perfectly situated for exploring all that's great about Whitstable being one minute walk from the beach, two minutes from the harbour with its wonderful fish market and a five minute walk to the main shopping street and restaurants. The apartment has one double bedroom, a living/ dining room with double sofa bed , separate kitchen and a bathroom. There is free WiFi, Free view TV and a DVD player.We provide bed linen and towels. Bathroom with shower over bath. Please note that the bathroom has a low ceiling . Free parking is available on the residential street around the corner from the apartment, Northwood Road. There is a small icebox suitable for ice cream, ice and one or two packs of frozen food. We provide salt, pepper, oliver oil, vinegar and a few herbs. We also provide tea , coffee and sugar. Electric hob and oven, fridge, microwave, washing machine.Fully equipped with crockery and cooking utensils. Dining table and four chairs in living room. Notes on accommodation: Non smoking. Sorry we cannot accept pets. The apartment is not suitable for 4 adults ( max 3 adults ) but we can accept up to 2 children. The price per week is based on two adults. There is an extra charge of £5 per person above two . Towels / Linen Towels and linen are included. The harbour loft was bright , cheerful and clean . It was well equipped and a great location for walking and for pubs and restaurants . We would recommend it . Thanks so much for taking the time to write a review, much appreciated. We hope you can return soon. The perfect place to stay when it whitstable. 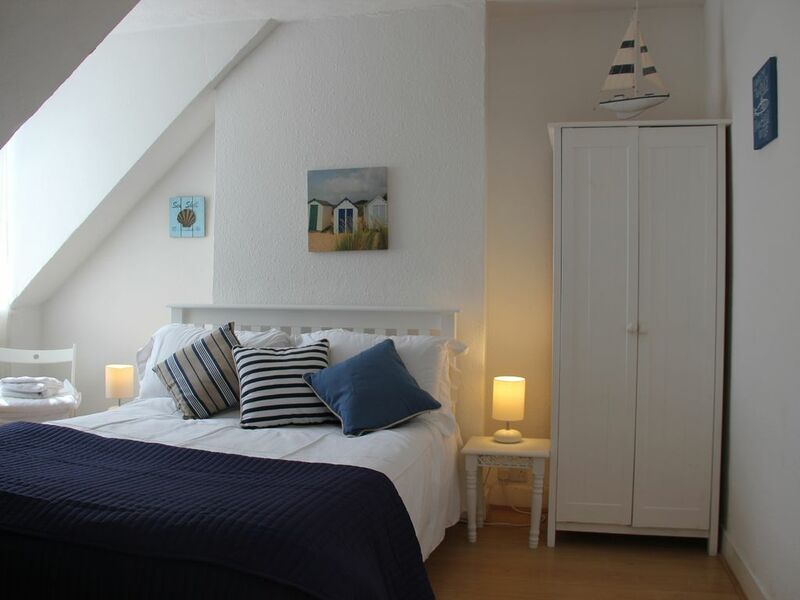 Harbour loft is spacious, clean and tidy with everything you need to enjoy some time away. We spent 7 nights at Harbour Loft during the recent heatwave! The apartment was clean and comfortable and represented what we had paid for it. There were fans in the lounge and bedroom which were needed and it is situated in a quiet part of Whitstable but only minutes from the busy town centre. There is parking at the back of the property as well as free on road parking nearby. There is an excellent bus service into Canterbury which we used a few times. Whitstable has many pubs and restaurants which do get busy at weekends so booking is recommended! We had the most delicious breakfasts at Milk and Honey which is just below the apartment - highly recommended! All in all we had a very pleasant stay at Harbour Loft and would recommend to others for the price we paid. This light, bright apartment, surprisingly large, was just perfect for our short break. We could see the sea, walk into town, or saunter along the seafront at Tankerton. Everything was in short walking distance, without being in the hustle and bustle of the town centre. Lovely little apartment, with a great location, clean, tidy and everything you could need. Very impressed with the apartment, it had everything you could want - a real home from home. Great location to visit all Whitstable has to offer - great restaurants and lovely local shops. We'll be coming back! A car is not really necessary as most of Whitstable`s attractions are within easy walking distance. There are several excellent restaurants in Whitstable all within walking distance of the apartment. Whitstable is famous for its amazing sunsets which can be appreciated with a drink outside the nearby Hotel Continental or at the Neptune pub which is right on the beach. If you fancy exploring further a field there is a bus stop just outside where you can catch a bus to the historic City of Canterbury or the attractive seaside town Herne Bay. There is a supermarket and banks on the High Street as well as many delightful smaller shops in Harbour Street. Whitstable really is the place for a relaxing and interesting holiday.